Drugmakers Slash Spending On Doctors' Sales Talks : Shots - Health News The sharp decline in payments coincides with increased scrutiny of drug marketing. Later this year, federal law will also require that drugmakers disclose the amount of money they give to doctors. Now that Eli Lilly & Co.'s antidepressant Cymbalta and some other blockbusters have gone generic, the company is spending less on promotional activities by doctors. Some of the nation's largest pharmaceutical companies have dramatically reduced payments to health professionals for promotional speeches amid heightened public scrutiny of such spending, a ProPublica analysis shows. Eli Lilly & Co.'s payments to speakers dropped by 55 percent, from $47.9 million in 2011 to $21.6 million in 2012. Pfizer's speaking payments fell 62 percent over the same period, from nearly $22 million to $8.3 million. And Novartis, the largest drugmaker in the U.S. as measured by 2012 sales, spent 40 percent less on speakers that year than it did between October 2010 and September 2011, reducing payments from $24.8 million to $14.8 million. The sharp declines coincide with increased attention from regulators, academic institutions and the public to pharmaceutical company marketing practices. A number of companies have settled federal whistleblower lawsuits in recent years that accused them of improperly marketing their drugs. In addition, the Physician Payment Sunshine Act, a part of the 2010 health reform law, will soon require all pharmaceutical and medical device companies to publicly report payments to physicians. The first disclosures required under the act are expected in September and will cover the period of August to December 2013. Within the industry, some companies are re-evaluating the role of physician speakers in their marketing repertoire. GlaxoSmithKline announced in December that it would stop paying doctors to speak on behalf of its drugs. Its speaking tab plummeted from $24 million in 2011 to $9.3 million in 2012. Not all companies have cut speaker payments: Johnson & Johnson increased such spending by 17 percent from 2011 to 2012; AstraZeneca's payments stayed about flat in 2012 after a steep decline the previous year. Some companies in the database said their declines have less to do with the Sunshine Act and more to do with the loss of patent protection for key products. Lilly, for example, began facing generic competition to its blockbuster antipsychotic Zyprexa in late 2011. Its antidepressant Cymbalta lost its patent at the end of 2013. "The value of educational programs tends to be higher when we're launching a new medicine or we have new clinical data/new indication," Lilly spokesman J. Scott MacGregor said in an email, adding that the drop in speaking payments also reflects the increased use of Web conferencing. Pfizer's patent on Lipitor, its top-selling cholesterol drug, expired in 2011. "Like any other company, our business practices must adapt to the changing nature of our product portfolio, based in part on products going off patent and new products being introduced into the market," company spokesman Dean Mastrojohn said in an email. Novartis' patent for its breast cancer drug Femara expired in 2011, its hypertension drug Diovan in 2012 and its cancer drug Zometa in 2013. In a statement, Novartis said speaking payments dropped in 2012 in part because of a shift from big blockbuster drugs that many doctors prescribe toward specialty products prescribed by fewer physicians. Resources were also shifted "to support potential future product launches," a spokeswoman said in an email. One of the first drugmakers to disclose its payments to doctors has pulled the data offline. Cephalon, now a subsidiary of Teva Pharmaceutical Industries, had reported its ties to doctors since 2009 under the terms of a Corporate Integrity Agreement with the inspector general of the Department of Health and Human Services. The pact was put in place after the company agreed to pay a $425 million settlement in 2008 for marketing Actiq, Gabitril and Provigil for uses not approved by the Food and Drug Administration. But that requirement expired last September, and Teva pulled the data offline earlier this year when it updated its website. Cephalon's payments from 2009 to 2012 continue to be available on ProPublica's Dollars for Docs website, which aggregates payments made by 15 pharmaceutical companies since 2009. During that time, the company reported nearly $90 million in payments to doctors. The gap in the company's disclosures will be short. Teva will have to resume publicly reporting its payments to doctors later this year under the Physician Payment Sunshine Act, which requires that all pharmaceutical and medical device companies disclose payments over $10 to doctors. The first report, covering the period of August to December 2013, is expected to be released in September of this year. 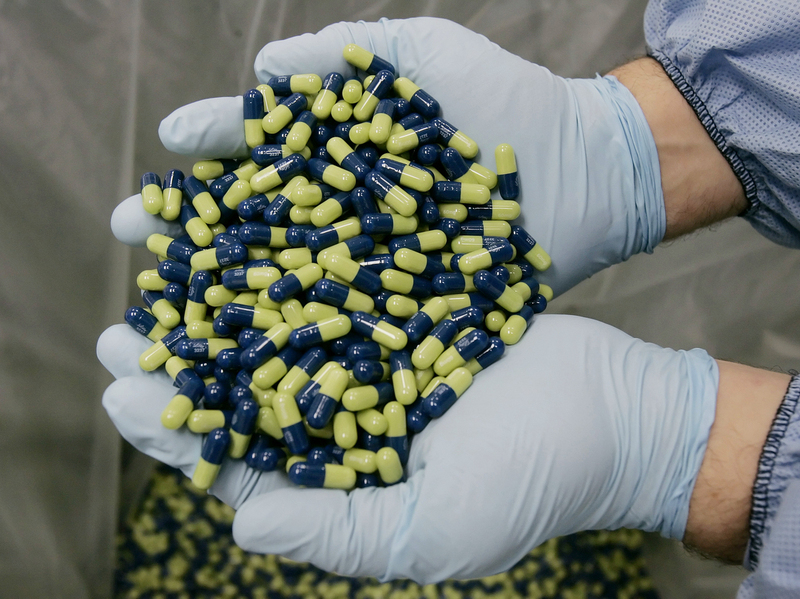 The industry's increased emphasis on expensive specialty medications for such conditions as multiple sclerosis or hepatitis C has been striking, said Aaron Kesselheim, an assistant professor of medicine at Harvard Medical School. A piece in the New England Journal of Medicine last week noted that half of the 139 drugs approved by the Food and Drug Administration since 2009 were for rare diseases and cancers. "It's possible the number of physicians they need to support sales of these items is less, leading to lower payments overall," Kesselheim said. In some cases, companies maintained or made smaller cuts to other forms of physician compensation while pulling back dramatically on speaking payments. 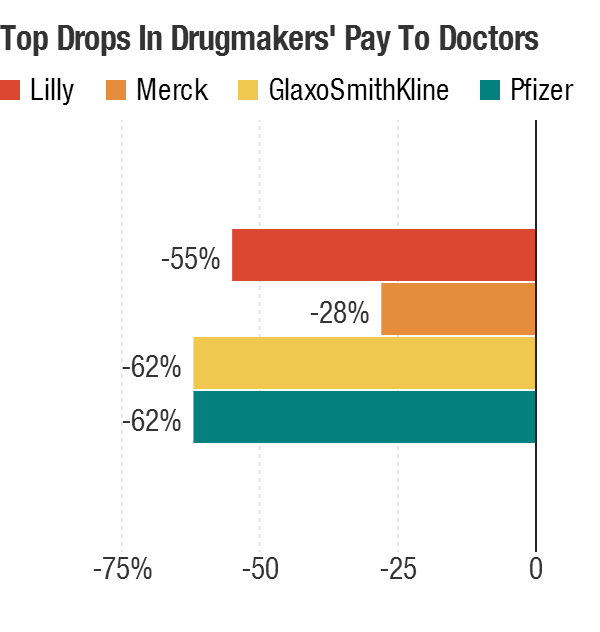 Pfizer's spending on consultants dropped 9 percent from 2011 to 2012, far less than its payments to speakers. The company's spending on research stayed essentially the same. Lilly increased spending on physician researchers by more than 20 percent, while reducing payments to consultants by more than two-thirds. Many bioethicists and leaders of major academic medical centers frown upon physicians delivering promotional talks for drug companies, saying they turn doctors into sales representatives rather than leaders in research and patient care. Officials with Pharmaceutical Research and Manufacturers of America, an industry trade group, dispute this characterization. They said they are working with their member companies to prepare for the Sunshine Act and have created a campaign to promote the value of drug company-doctor collaborations. "Companies will make their own independent decisions about how to engage professionals," said Kendra Martello, PhRMA's deputy vice president of strategic operations. Scott Liebman, an attorney who advises pharmaceutical companies on the Sunshine Act, said it's too early to know how much the law's requirements are affecting company practices, in part because it's so new. The fact that some companies are cutting back on speaking while preserving their spending on research and consulting suggests that other business forces could be at play, he added. "It's very hard to pinpoint exactly why that's happening," Liebman said. "I think there's a lot of potential answers to that. I just don't know which is the right one."